c gyms and clubs. Stable and solid, the Body-Solid SGH500 Glute & Ham Developer is an essential piece for any workout facility. Glute/Ham developers have been gaining in popularity for all types of commercial facilities and have never been more popular. The SGH500 is the best way to target and isolate the posterior chain muscles; the gluteus, hamstrings and calves. 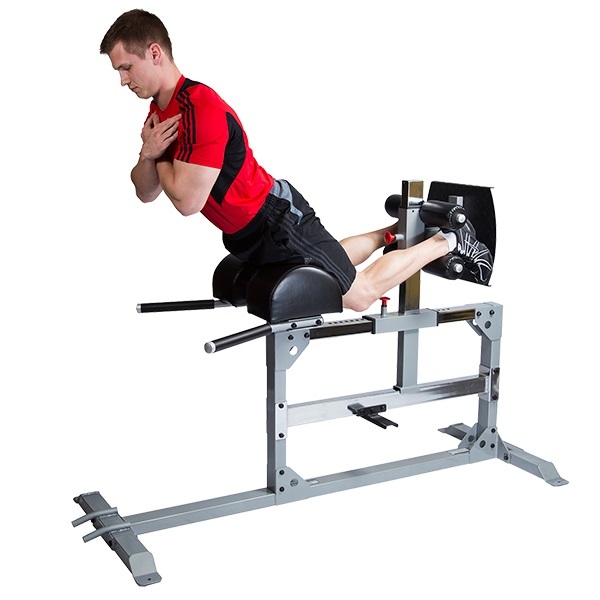 The Body-Solid SGH500 Glute & Ham Developer is also versatile enough for ab, back and oblique workouts. The new Body-Solid SGH500 Glute & Ham Developer carries on the Body Solid tradition of combining quality and durability at an amazing value. Premium commercial components ensure dependability and reliability even in heavy use, high-traffic gyms and clubs. Stable and solid, the Body-Solid SGH500 Glute & Ham Developer is an essential piece for any workout facility. Rated for commercial use, the Body-Solid SGH500 Glute & Ham Developer is comprised of heavy duty 2”x3” 11 gauge steel tubing. The foot plate and rollers adjust horizontally and vertically ensuring a proper fit for any size user. The oversized split crescent pads are made from top quality foam and covered in our exclusive durafirm upholstery. Compared to other units, the added handles and step up foot plate make the SGH500 easy to mount and dismount. The SGH500 is in stock now. The new SGH500 carries on the Body Solid Pro Clubline tradition of combining quality and durability at an amazing value. Call 1-800-875-9145 to chat with one of our fitness advisors with any questions you may have about the Body-Solid SGH500 Glute & Ham Developer. Don't wait to start getting faster results to achieving a stronger and healthier body with the Body-Solid SGH500 Glute & Ham Developer. Order your Body-Solid SGH500 Glute & Ham Developer from FitnessZone.com today! Order your Body-Solid SGH500 Glute & Ham Developer from FitnessZone.com today!